I wound up in a discussion on Facebook earlier this week that consisted of various people discussing the merits of The Goonies versus Stand By Me. Both movies were filmed in the ’80s and focused on foul-mouthed Oregon kids going off on adventures. They also, coincidentally, featured anecdotes about large groups of people throwing up all over themselves (Chunk’s theater story and Gordy’s story about Lardass Hogan, respectively). 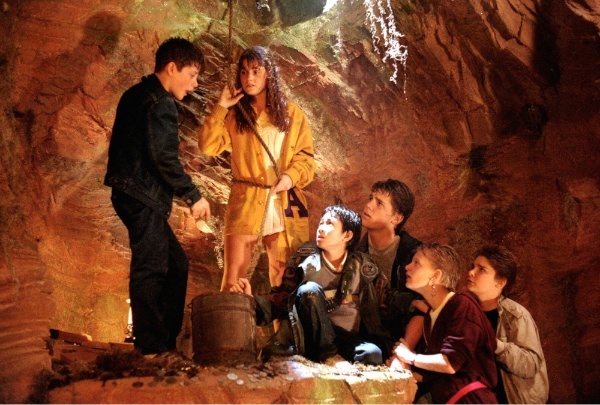 Despite that puke joke, I’ve probably seen The Goonies more than other film. I grew up in Portland and spent a lot of time out on the Oregon coast as a kid so there’s that. It, much like Stand By Me, presented kids as they often are: thoughtful and intelligent beyond their years, fearful of and powerless against the complexities of the adult world and as foul-mouthed as sailors. Stand By Me is easily the better of the two films but it’s not very much fun to watch on a rainy Saturday afternoon. But there’s a lot of stuff in The Goonies that really makes me cringe, Sloth being the prime example. I’m not sure why he needs to be in the film and his character is handled incredibly poorly (“you smell like fish heads!”). Can you imagine a scene about a developmentally disabled guy getting chained up in a cellar landing in a kid’s flick these days? In a nutshell, that’s why I still watch the movie every autumn when the leaves start turning orange and the seasonal gloom starts smearing itself all over the northern hemisphere. It’s also why I once hosted a show on KWVA, the University of Oregon’s campus radio station, that included a segment every week about the cancelled sequel when rumors were circulating in early ’00s (which always concluded with me hitting the play button on Cyndi Lauper’s “The Goonies ‘R’ Good Enough”). And why I once “broke into” the house in Astoria while it was being remodeled with two guys that had driven all the way from Kansas to see the place with their own eyes. And why I actually attended a 20th anniversary celebration in Astoria that included full grown adults doing “The Truffle Shuffle” alongside Jeff Cohen (I opted out). The movie turns 30 years old this Monday, June 7th, and there will be another celebration in Astoria honoring it. I won’t be there but I will be watching the following. It seems like an anniversary that I should acknowledge in one way or another even from all the way over here in the Netherlands. This entry was posted in movies, United States. Bookmark the permalink.